Customized jumbo size pig shape bottle opener keychain steals the show with its attractive shape and offers a large surface for marketers to position their business information! Perfect promotional choice for student banks, financial institutions, delicatessens and many more. This piggy bottle opener keychain can be gifted during individual or home parties, tradeshows, and school events or during service days. This bottle opener keychain serves as a perfect party ware, key holder and a unique amusement token. 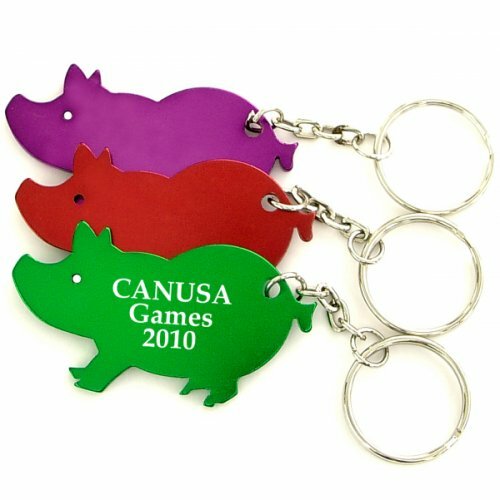 Request a quote to know discounts for wholesale orders of this promotional jumbo size pig shape bottle opener keychain. Available Colors - Metallic Black, Metallic Blue, Metallic Green, Metallic Gold, Metallic Pink, Metallic Purple, Metallic Red, and Metallic Silver. Product Size : 2 11/32" x 1 1/4"